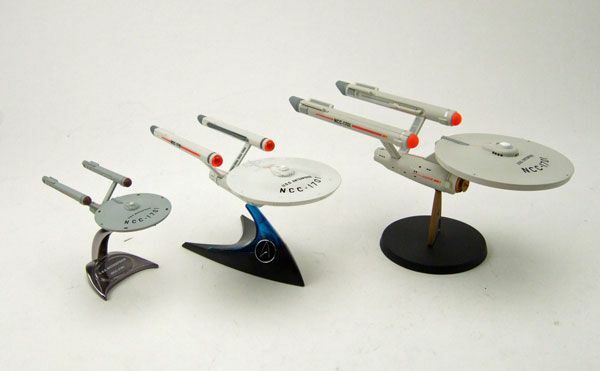 While none of the Hot Wheels Trek vehicles are the "definitive" versions of the ships they are replicating, I do really like their Enterprise. 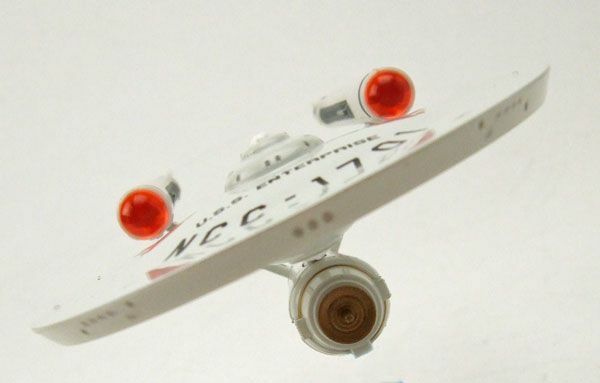 Maybe the simplistic beauty of the original Enterprise makes it easier to translate, but I think they did a fine job on her, perhaps even besting some of the other previous small-scale replicas. There she is amongst some other comparable Enterprises. The Hot Wheels version is considerably lighter in color than most current toy versions, which is something I like. Regardless of how accurate or inaccurate it is, the color reminds me very much of the old Dinky version (which, as we all know, ruled). Since the Costco set has 6 ships all together in one set, finding solid paint jobs across the board would seem to be a challenge. Surprisingly this isn't the case, as most of the sets I've seen have pretty even detailing. 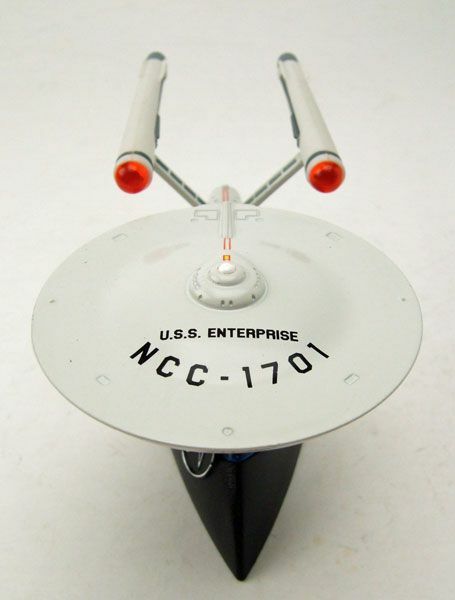 My Enterprise (and all the other ships in my set) has a very concise paint job, with no stray paint blotches that I can see. 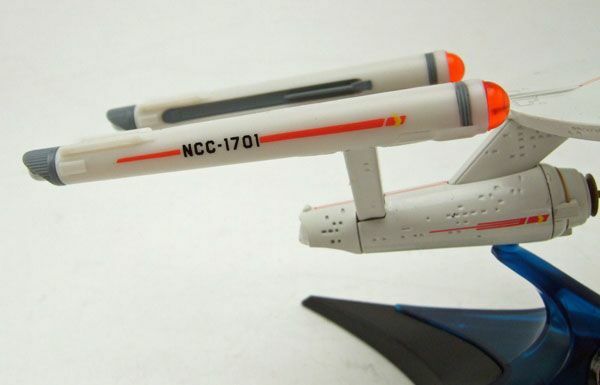 I really like how Mattel handled the illuminated nacelle tips of the show version. Instead of just painted caps, they used a translucent orange plastic. 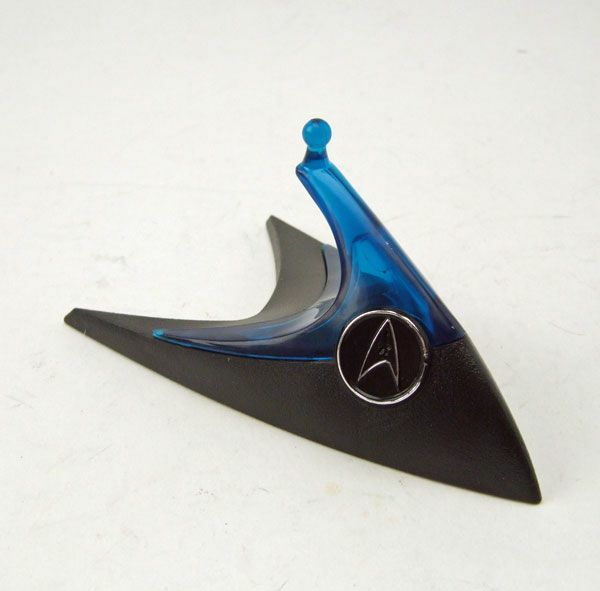 It's a small detail, but it adds a lot to the look of the ship. 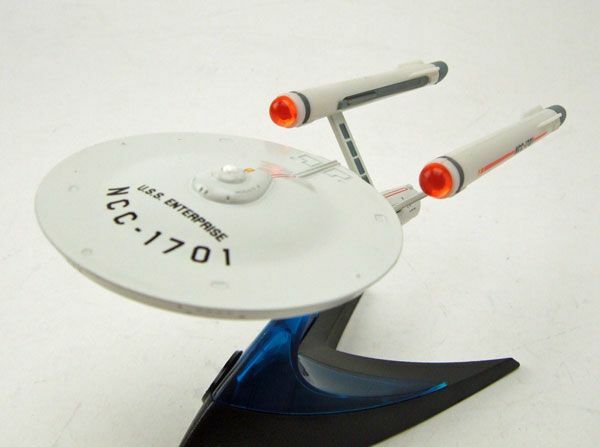 Of course, just like all their other releases in the Star Trek line, the Enterprise includes a nifty display base. How else are you going to display it? Duh. Would I recommend this one? Of course! 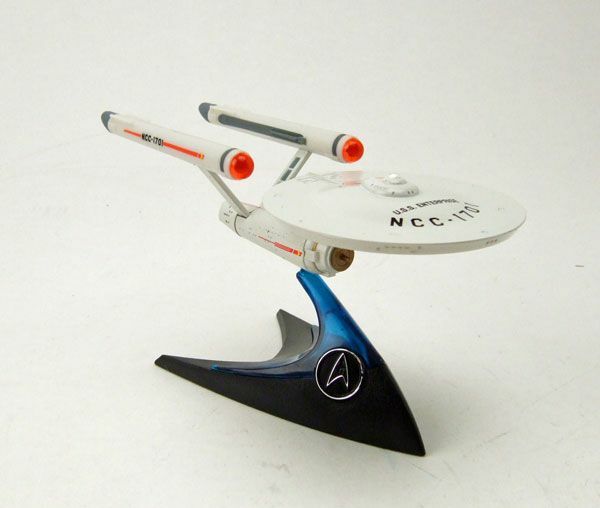 In my opinion, it's the most important ship in the entire Star Trek franchise- meaning no display in this scale is complete without it. 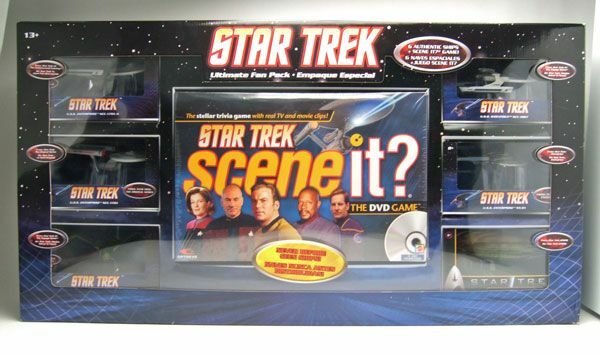 The only thing that stinks is that you have to buy a giant boxed set to get it. 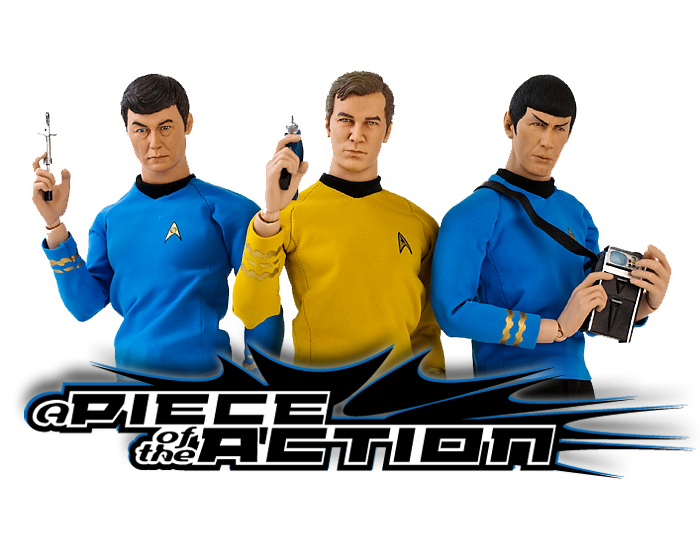 At the current retail of $24.97 though, this ship alone makes it worth the price of admission. This is probably the most accurately sculpted miniature Enterpise toy on the market. In fact, if I didn't know better ( and I don't ), I would swear that it was scanned from one of Master Replicas models...it's that good. If only mattel would take a hint from the Johnny Lightning line, and put as much effort into the paint apps. 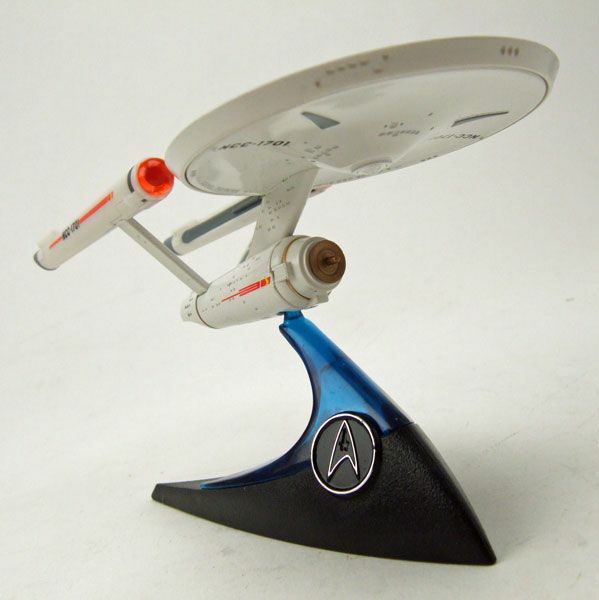 In fact my fantasy TOS Enterprise toy would be a combination of the Mattel sculpt and hull color, the JL paint details, and the approximate size, seemless construction, and overall diecast metal construction of the Corgi version. 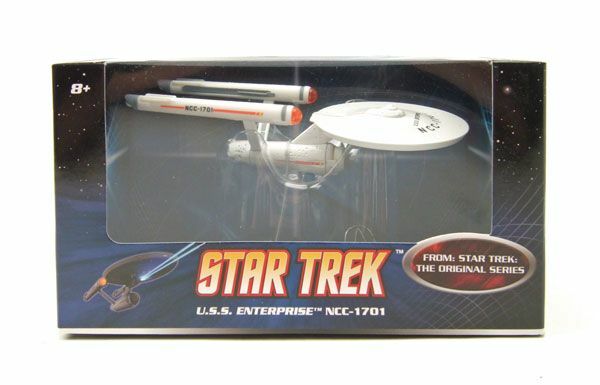 Not a Star Trek fan but looking forward to get some Enterprise die cast from Hot Wheels.